Is The Chicago Blackhawks Power Play Holding Them Back? The Chicago Blackhawks’ power play needs work. Chicago has fallen back into that trap of needing some serious work on at least one of their special teams and being one of the best in the league when at even strength. The trouble is, you’re not always going to be at even strength. While it’s vital to have a strong penalty kill it’s just as important to score on the power play. Good offense begins with good defense. As such, the penalty kill is a must. If you let in goal after goal on the penalty kill, you’re essentially handing over the keys to the stadium to your opponent. Chicago understands that, and delivers on the PK with an 87% kill rate. In fact, they have the highest PK% in the league, only letting in 18 goals on the power play in 54 games. As important as the penalty kill is, however, the power play cannot be squandered; the penalty kill is a must but the power play is a gift. It is your best chance to put an easy goal in your opponent’s net, playing mind games with the other team and giving you chance after chance to put a puck in the net. Looking at this chart cataloguing the combined PKs and PPs in the league, the Blackhawks do stand out. It’s clear their power play isn’t simply ineffective; it’s bad. 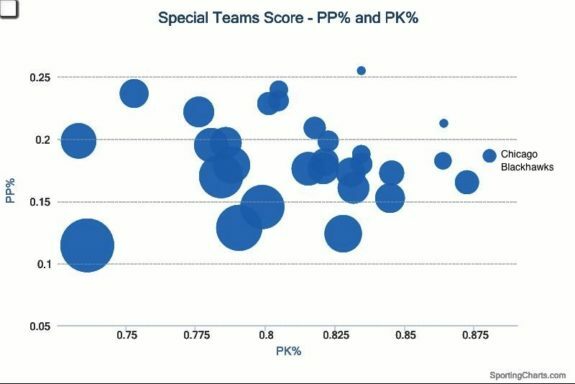 In fact, it’s bad enough to drop them to 15th place for special teams overall even with the advantage of the top PK in the league. If the Blackhawks weren’t such a dominant force at even strength (and on the penalty kill), their power play problems would be making more of an impact on their games. As it is, they haven’t won three in a row since their streak of eight games in November, and dropped their most recent one to the Coyotes. Yes, the Arizona Coyotes. The Coyotes of fifth-to-last in the league fame, of 20 games won and of “oh, right – I forgot about them” fame. It’s not necessarily dire, although it’s embarrassing for the average Hawks fan; the Blackhawks are working well and so far have a spot for them in the playoffs. They are slowly dropping behind their Central Division opponents, however, and are sitting in third place behind the Predators and the Blues, with four points separating them from second place. Things aren’t so bad that fans need to burn their Blackhawks gear or throw it on the ice à la Leafs fans. However the fact that the Blackhawks haven’t managed to win three in a row since November is troubling. While it’s tempting to brush their power play troubles aside, as it’s been seven years since Chicago missed a playoffs berth, and never have with this group of core players, complacency leads to mediocrity. It’s clear the Hawks need to work to make all aspects of their game elite to guarantee themselves a playoff spot. Efficacy on the power play will be a large part of that. Does The Power Play Matter In The Playoffs? It is interesting to note, however, that while special teams may be key to getting through the regular season smoothly, they don’t seem to have nearly as much impact on who gets through to the Cup Finals. Comparing the special teams stats of the past nine years of playoff winners (skipping 2005 due to the lockout) in only 22% of those seasons was the winning team’s regular-season power play even in the top 5 of the league. So while the power play might be necessary to a solid regular season, it isn’t the most impactful stat going into the playoffs, which will let Blackhawks fans rest easier. The Hawks understand hard work. And most of the core remembers the years when they didn’t make the playoffs, when hockey ended for them months before it should have. So even though the power play won’t be the deciding factor as to who wins — or even makes — the playoffs they must concentrate on improving it. Resting on their laurels doesn’t guarantee a downfall for the Blackhawks but it would indicate a problem within the team in terms of coaching. In essence, while Chicago’s power play troubles don’t spell doom or gloom, it is something to keep an eye on. Chicago’s management is always looking for ways to improve, and change is coming down the pipeline whether we look for it or not. While it’s unlikely that they would overhaul their coaching staff should the Hawks not make the playoffs, the players are not the only ones working to keep their jobs season in and out.